Hello. 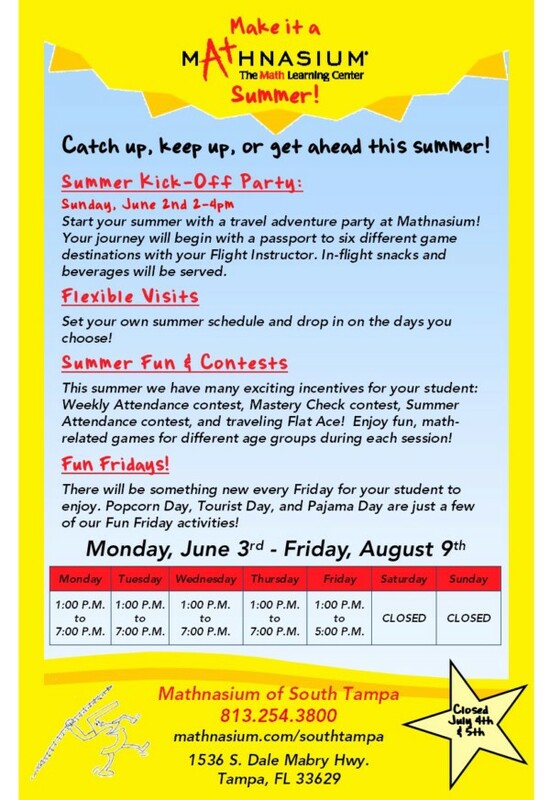 I'm Shannon Danielson, Owner of Mathnasium of South Tampa, your neighborhood math-only learning center. We help kids in grades 1-12 understand math by teaching the way that makes sense to them. Mathnasium of South Tampa is a proud sponsor of Plant High School's Academic Foundation, Robinson High School, Coleman Middle School, Wilson Middle School, Roland Park IB, MacFarlane Park IB, Dale Mabry Elementary, Mitchell Elementary, Roosevelt Elementary, Gorrie Elementary, St. John's Episcopal School, St. Mary's Episcopal School, Tampa Preparatory School and many other school activities in our community. Contact us today for a FREE Trial Session and see how we can help your child!